The Snæfellsness peninsula in West Iceland was made famous by the French author, Jules Verne, when he used Snæfellsjökull volcano as a location in his novel, Journey to the Center of the Earth. Snaefellsnes is a wonderland of great geothermal activity, the most photographed mountain in Iceland, charming little fishing villages and extraordinary sights. 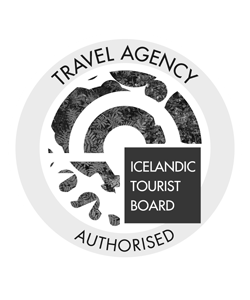 The peninsula is often nicknamed “Iceland in a nutshell” due to its vast variety in and contrast! Where is The Snaefellsnes peninsula? 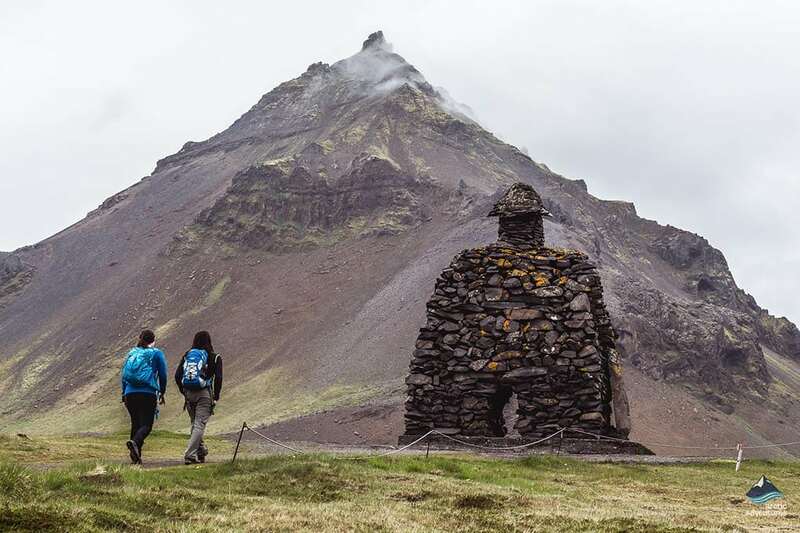 What to do on the Snæfellsnes Peninsula? 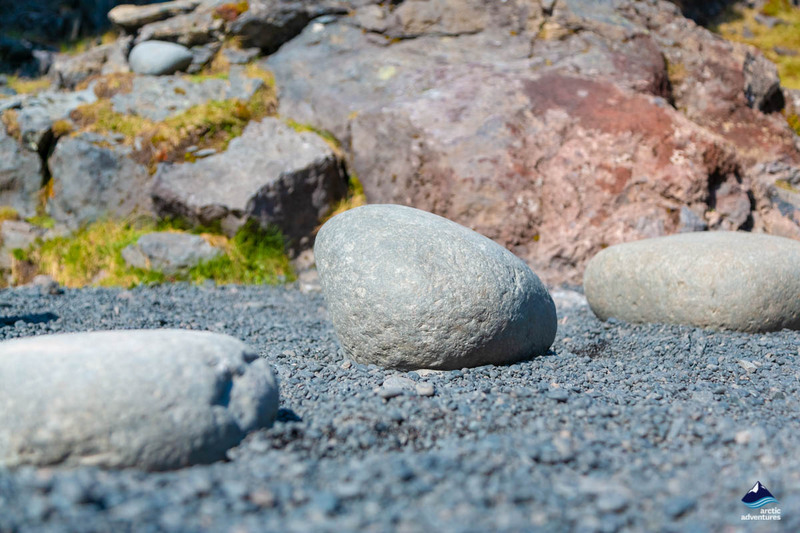 Snæfellsnesnes “Iceland in a nutshell” is a geological wonderland in West Iceland with spectacular vast views reaching over mountains, lava fields and empty roads. Driving along the peninsula you can visit charming little fishing villages often with an evident Danish influence, both in culture and architecture. 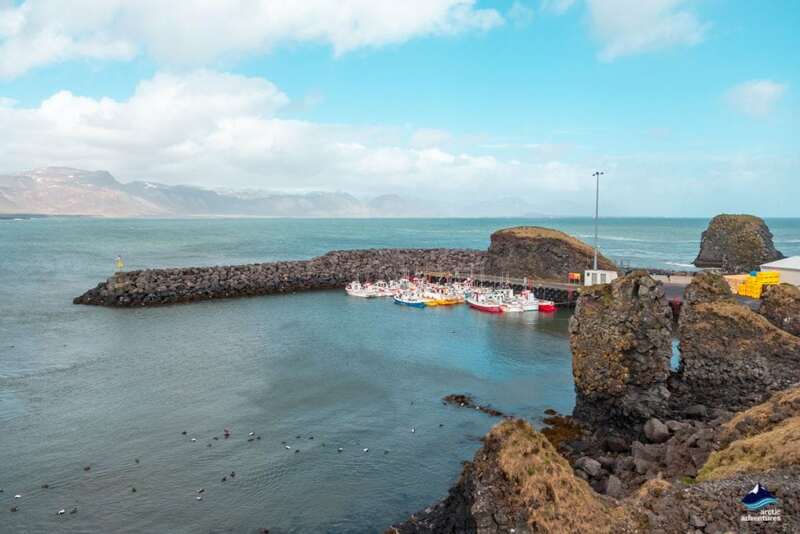 There is something truly special about the peninsula which in the year 1864 became famous along with its towering Glacier Volcano, Snæfellsjökull, when the author Jules Verne wrote it to be the opening to the center of the earth in his eponymous book Journey to the Center of the Earth. The book became a big hit and ended up being portrayed in movies, in 1959, 1978, 1989 and lastly in 2008 starring the Icelandic actress Anita Briem and the famous Brendan Fraser. The story has also been portrayed in theatre, theme parks, radio, video games, television film and a series and the list goes on. 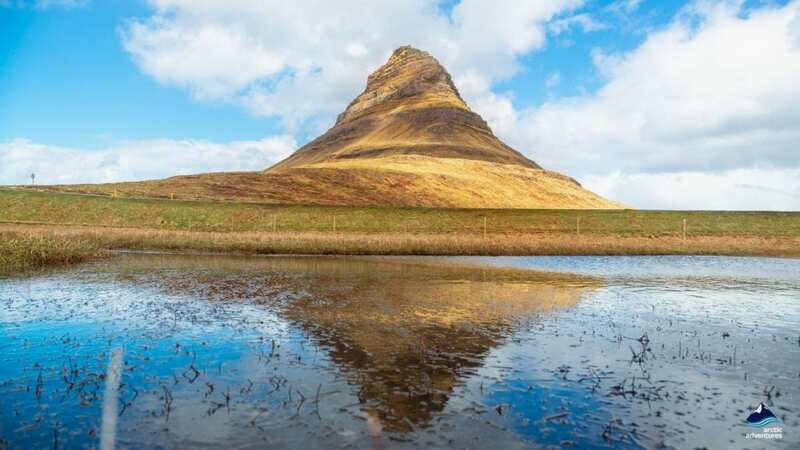 But long before all this, Snæfellsnes was mentioned in the Icelandic Bárðar Saga, which tells the story of Bárður, who according to legend was half-ogre and half man. 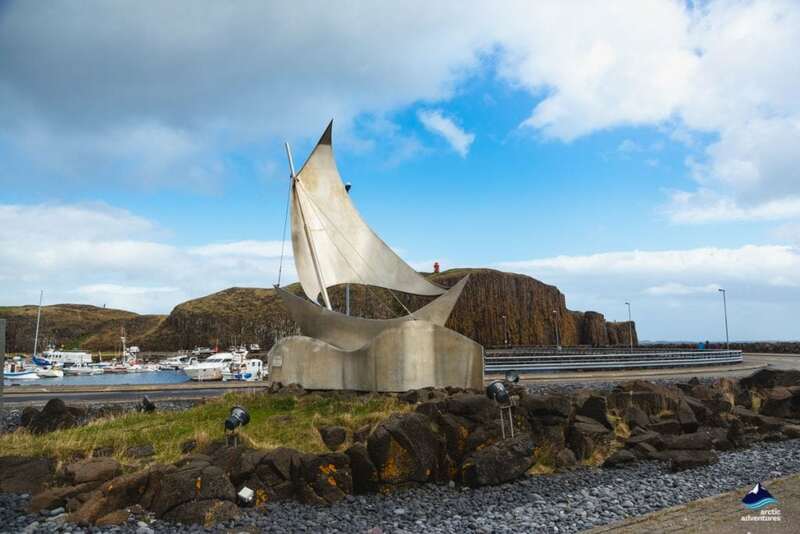 There is a tall sculpture commemorating Bárðar on the hillside at Arnarstapi, a picturesque fishing village. 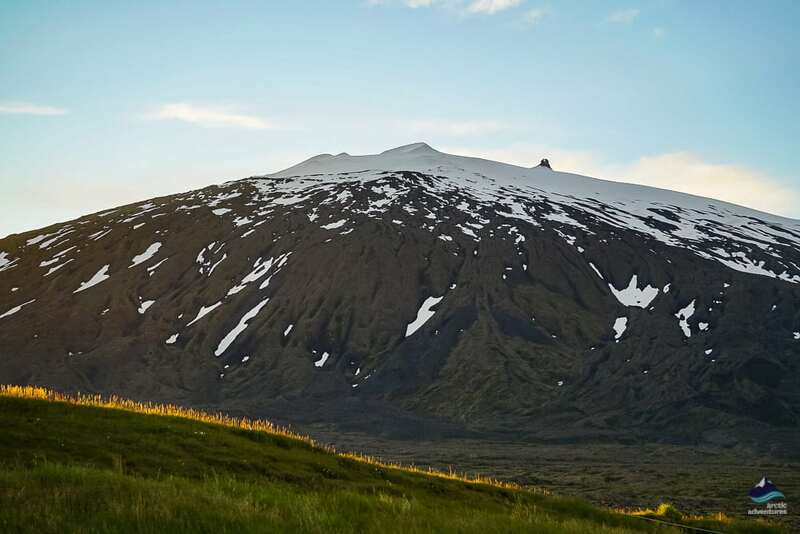 Snæfellsjökull, Iceland’s most iconic glacier, dominates the landscape – and you can actually hike to its top, the reward being otherworldly views. This staggering glacier can on most days be seen from the capital and its vicinity where it seems to rise solely from the ocean in all its splendor! 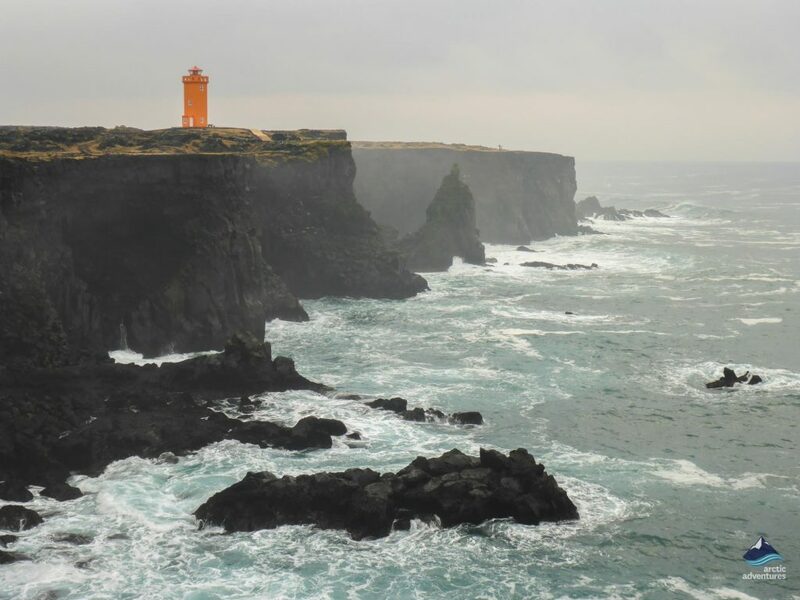 There is so much to see and do on Snaefellsnes peninsula. The small towns and fishing communities include Arnarstapi, Hellnar, Rif, Grundafjörður, Stykkishólmur, Ólafsvík and Búðardalur, each place has a different character. 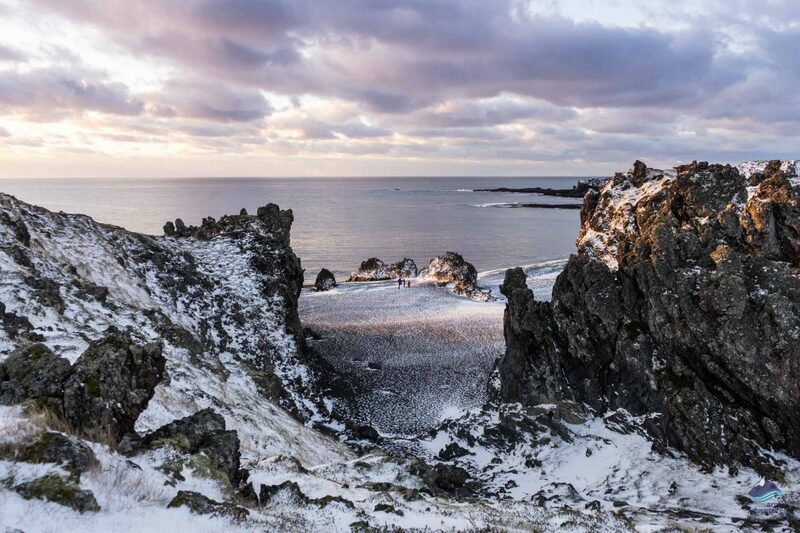 The people of Snaefellsnes care deeply about protecting nature. 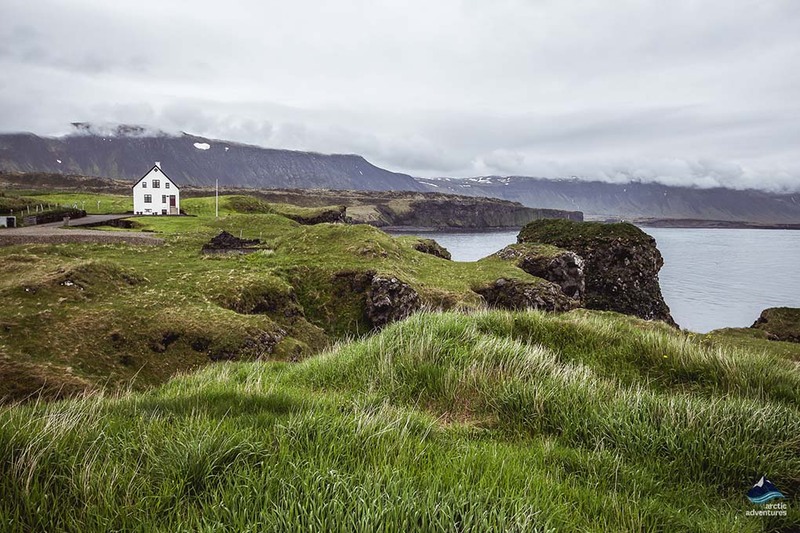 In 2008 this was the first community in Europe to receive the EarthCheck Certificate for sustainable tourism and Stykkishólmur was the first town in Iceland to go plastic-bag free. 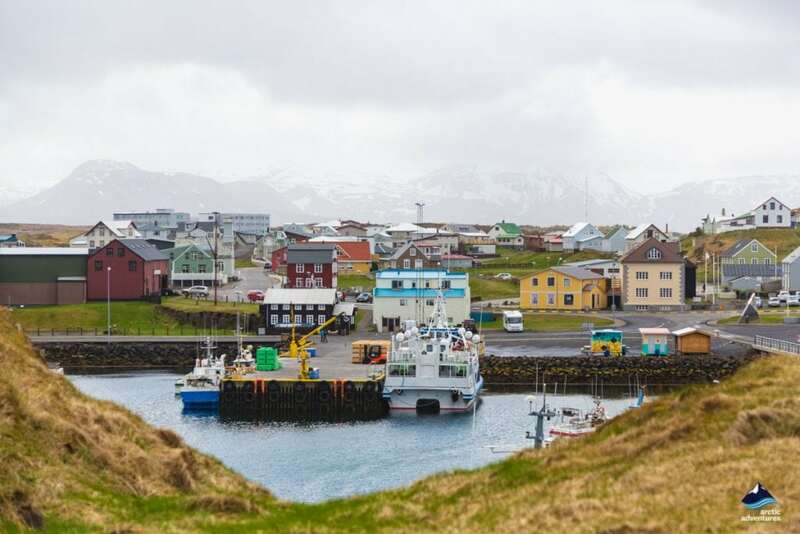 New Age visitors from around the world have declared Snæfellsnes to be one of the world’s most important energy centers. Most certainly, it is very hard to forget the forces of nature and creation here. 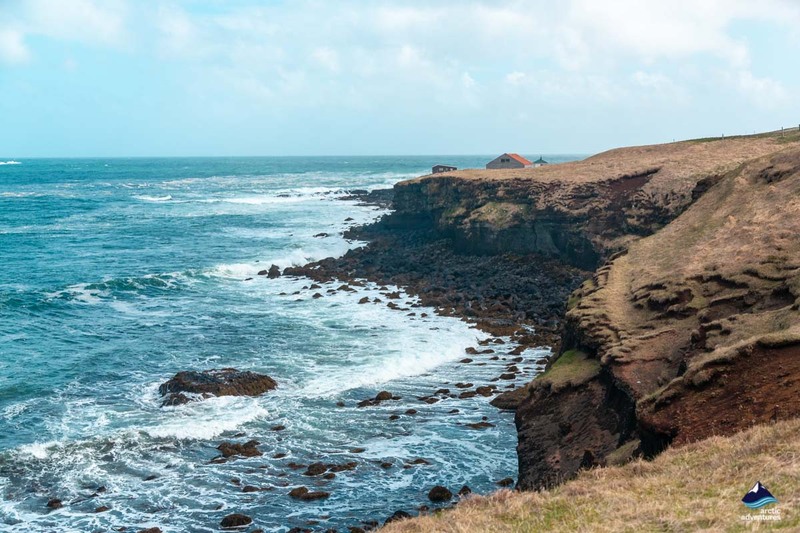 There are picturesque coves with dramatic black beaches, waterfalls, an interesting Volcano Museum at Stykkishólmur, the Shark Museum at Bjarnahöfn where you can learn all about and even taste the famous hákarl, or rotten fermented shark! 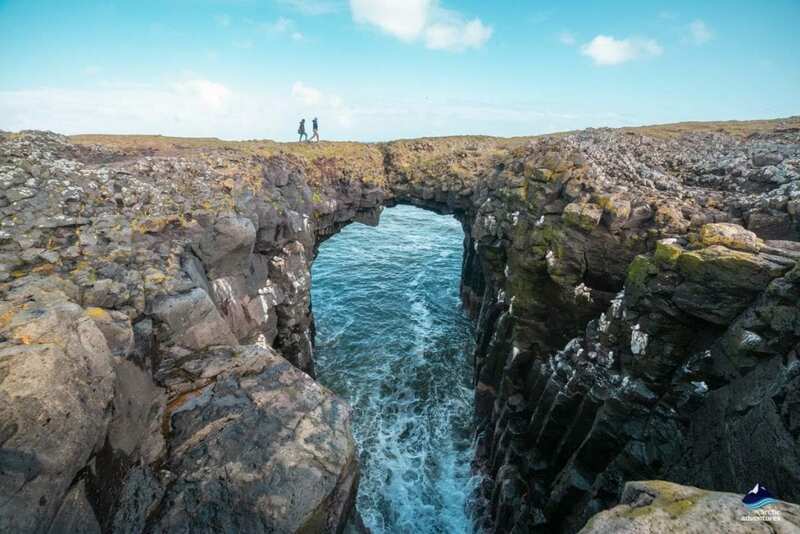 The scenery here is spectacular but particular highlights include the area around Dritvík and Djúpalónssander, coves which are framed by dramatic cliffs. 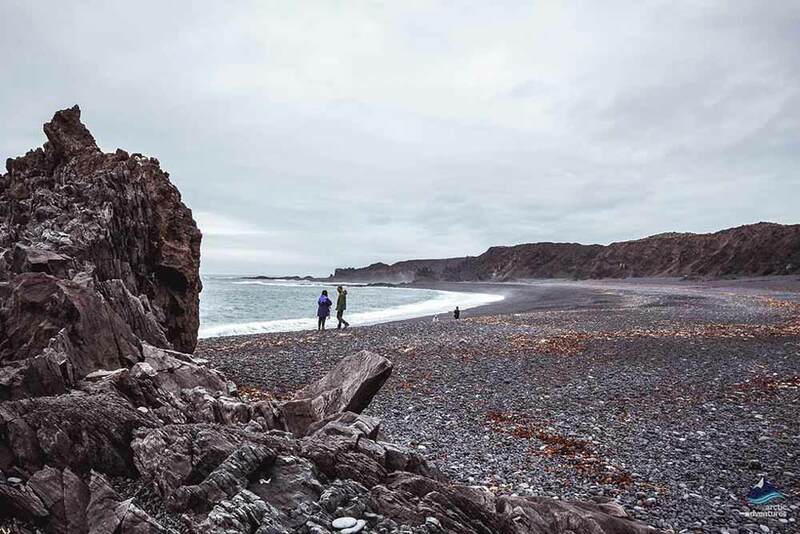 Exploring these black pebble beaches as the white tipped surf flows over them is wonderful and walking the headland which connects them is highly recommended. 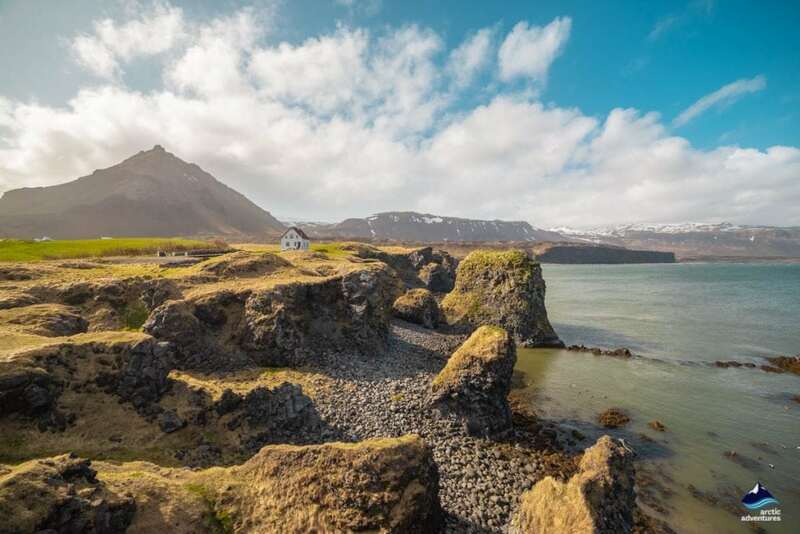 Snæfellsnes Peninsula can easily be visited on a day tour out from the capital! 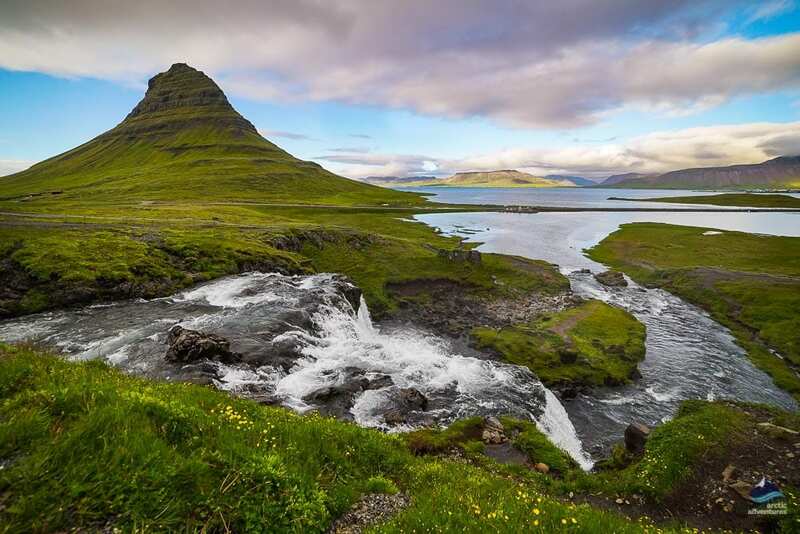 Where is The Snaefellsnes peninsula located? Snæfellsnes is a peninsula in West Iceland so there are various places to mention. Stykkishólmur is 165 km (102,5 mi) from Reykjavík and 96.1 km (60 mi) from Borgarnes. Mt. 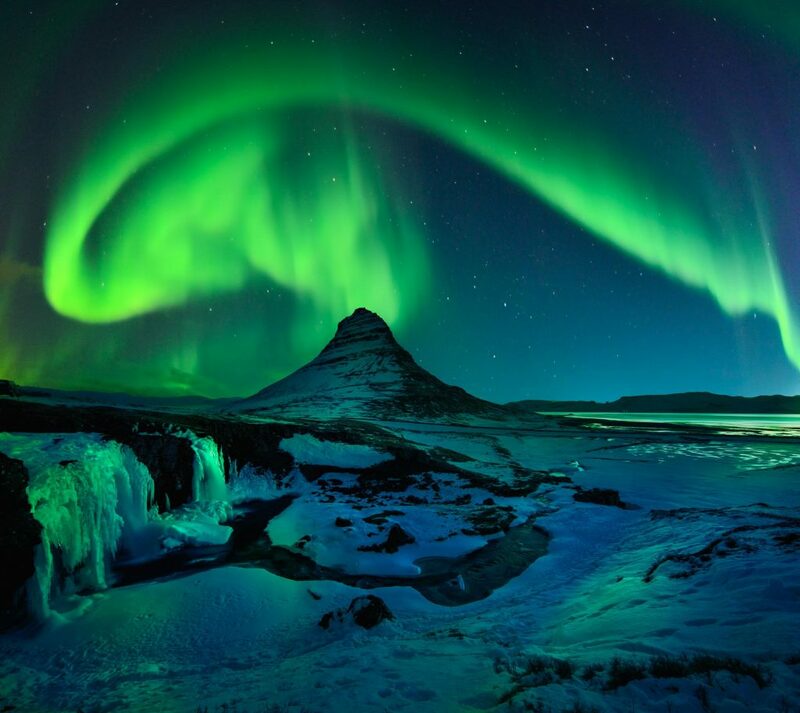 Kirkjufell is 172 km (106,8 mi) from Reykjavík. Arnarstapi is 186 km (115,6 mi) from Reykjavík and Hellnar is 4.3 km (36,7 mi) from Arnarstapi and 188 km (116,8 mi) from Reykjavík. 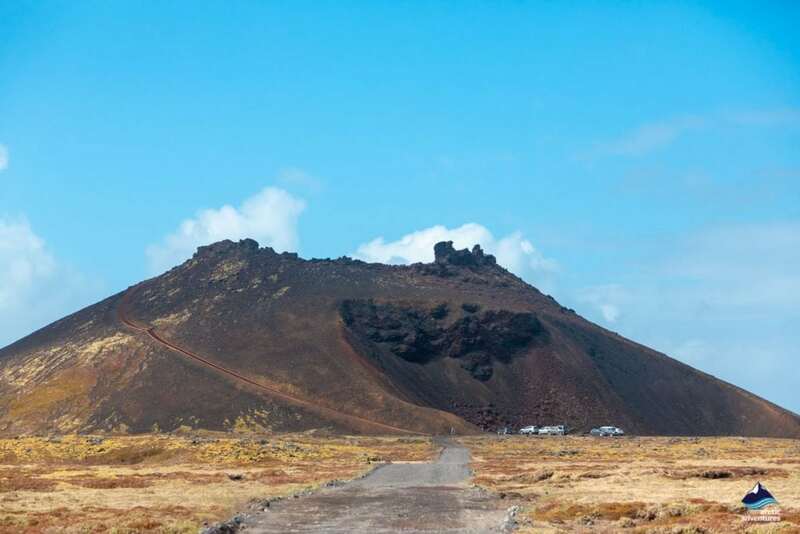 How to get to the Snæfellsnes Peninsula? 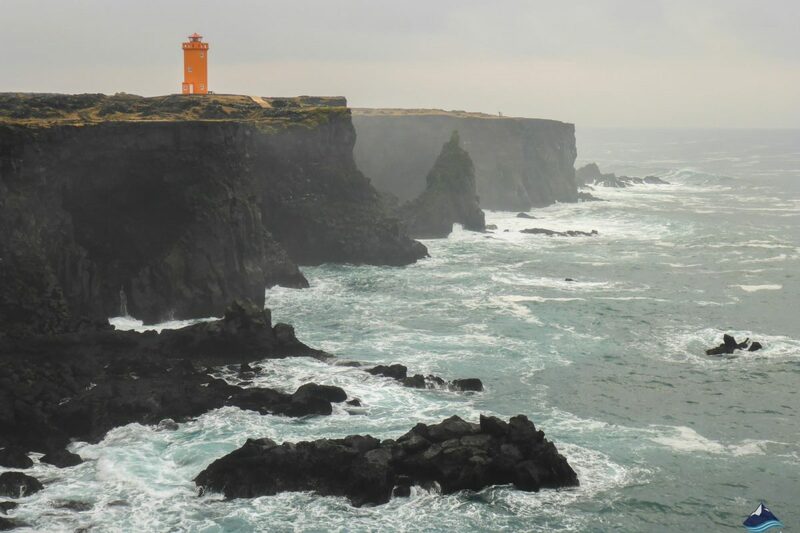 There are so many different options when it comes to visiting Snæfellsnes peninsula. You can easily visit an exciting tour, be it a day tour or a multi-day tour. 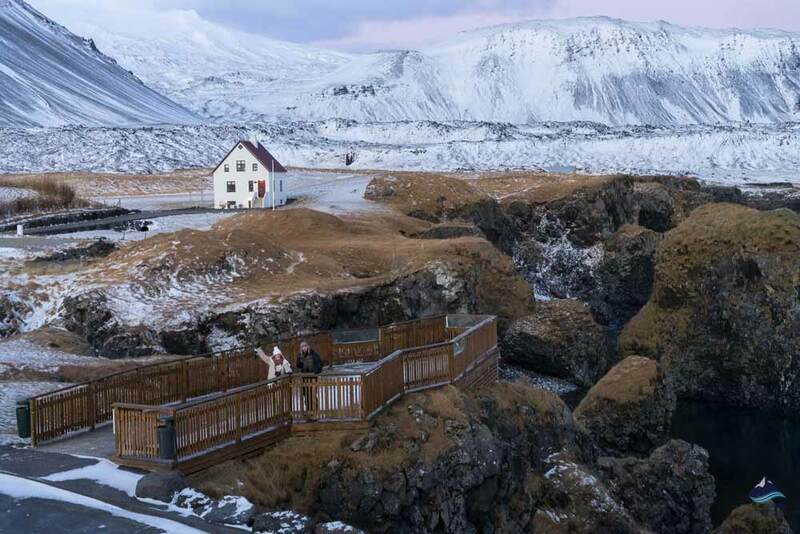 You can jump on a public bus to reach Snaefellsnes or you can easily rent a car and drive! 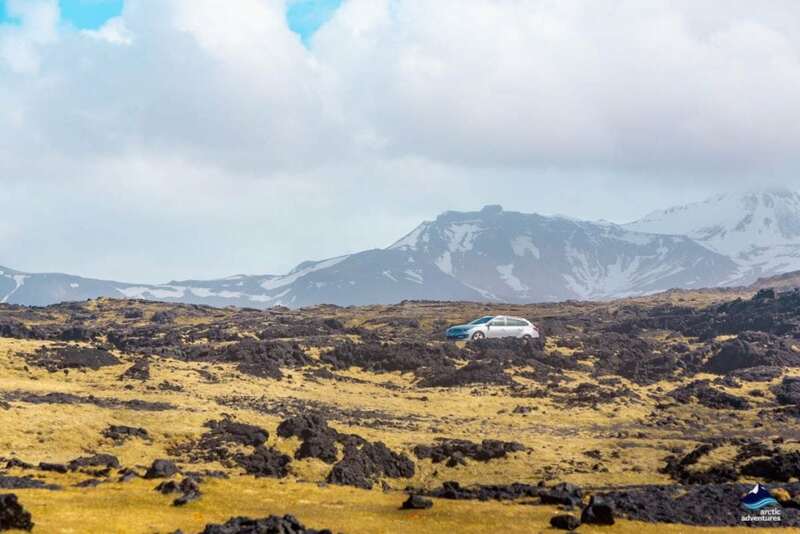 Driving from Reykjavík to the Snæfellsnes Peninsula should take about 1,5-2 hours. You will, for the most part, follow the enchanting Ring Road 1 through Mosfellsbær, past Mt. Esja and onwards through the undersea tunnel Hvalfjarðargöng, into Borgarfjörður valley and into the town of Borgarnes. Here you will make a left turn at the last roundabout on to road 54. The road 54 will take you well into the beautiful peninsula. Driving from Akureyri to the Snæfellsnes Peninsula should take about 4,5-5 hours and again you will mainly be following road one. 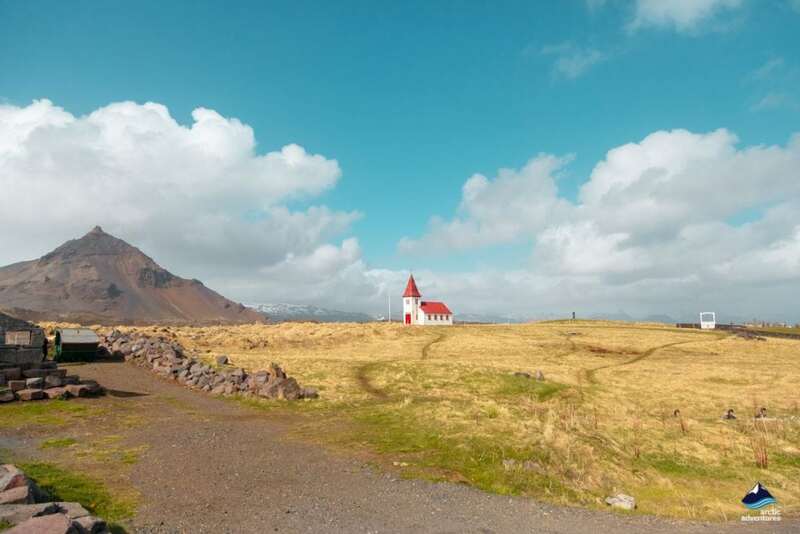 The drive will take you into the horse mecca of Iceland, Skagafjörður, past villages Varmahlíð and Blönduós, onwards into the seal colony of Húnaflói, down to Borðeyri and into the area of Reykholt. 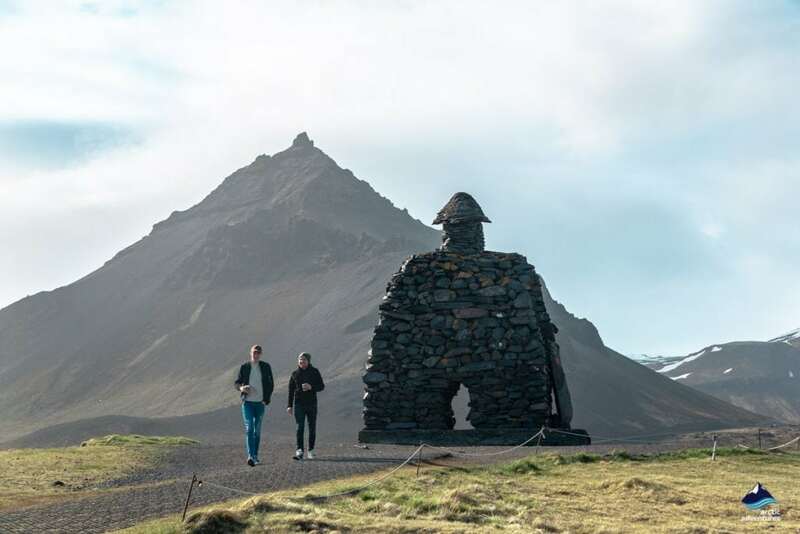 Following route 1 you will surely – reach the border of the town Borgarnes where you will take the turn onto road 54 on the roundabout and continue to the Snæfellsnes peninsula. Where to start! 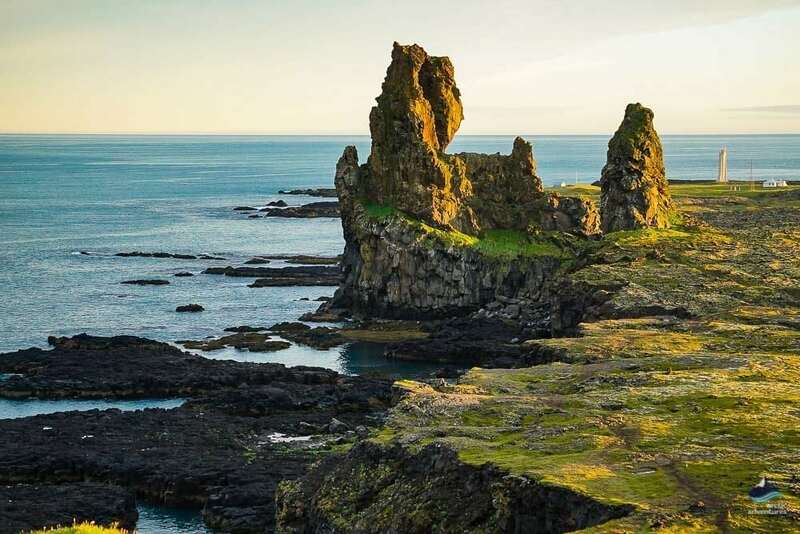 Snæfellsnes Peninsula is packed with adventures at every corner and is a great location for any age to visit because of is vivid variety in activities and sights. After all, it is not seldomly called Iceland in a nutshell. 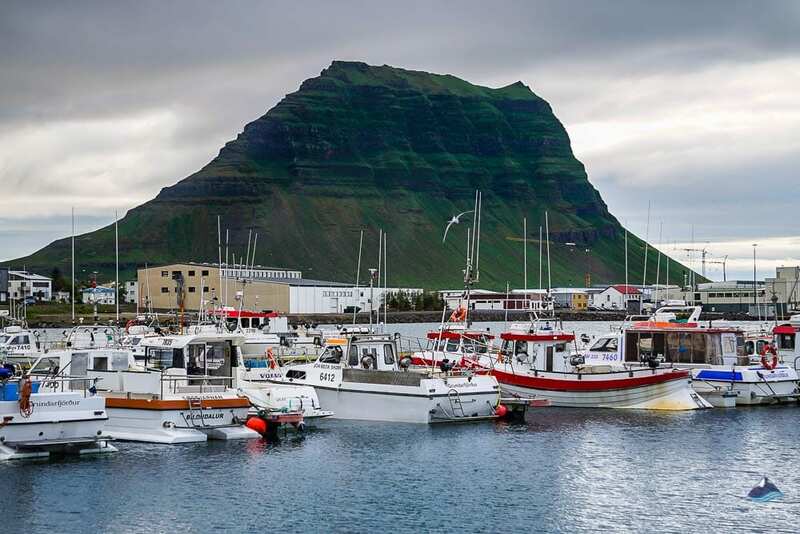 Visit a charming little fishing village – be it Stykkishólmur, Grundarfjörður, Arnarstapi, Ólafsvík or Rif just do it. The charm and characteristics are truly captivating. 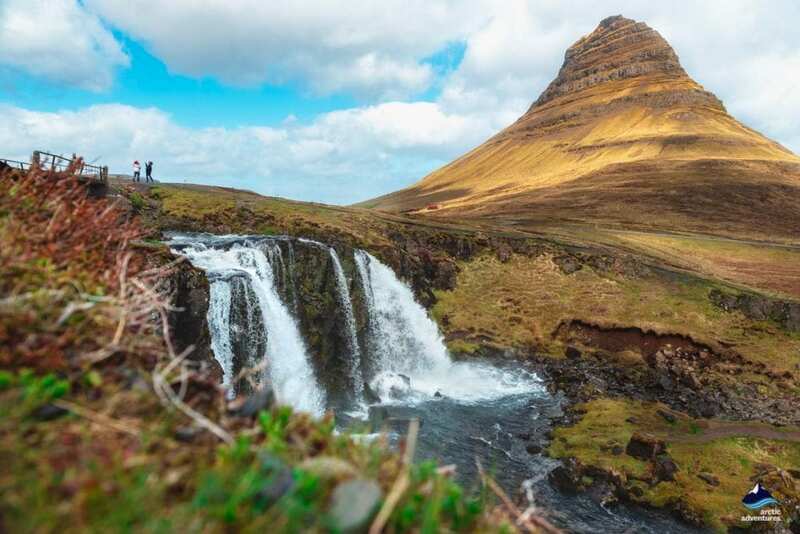 See the Kirkjufell mountain and its neighboring waterfall – there is a reason why this thin hat like mountain continues to end up on top 10 most beautiful mountains lists all over the world. It is simply without comparison! 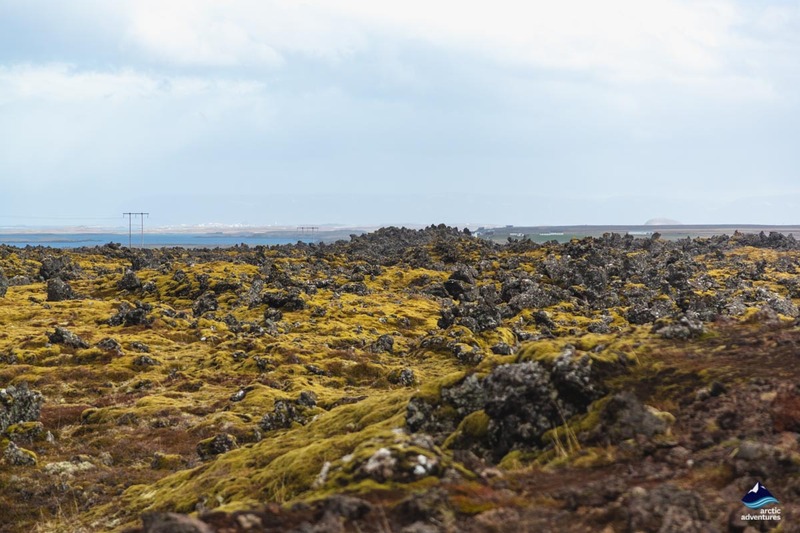 Make a stop at one of the Berserkjahraun parking lots – to take in the vastness and how the soft moss and rough lava create the most ravishing contrast is a memorable experience. 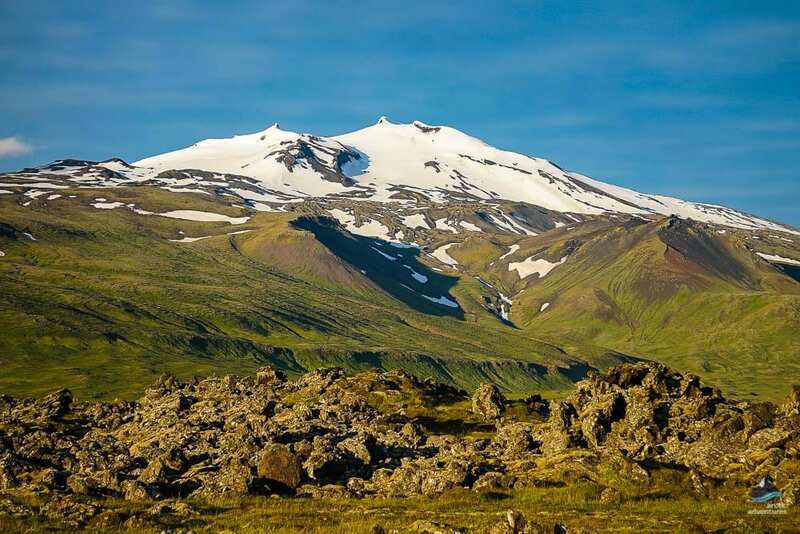 Get close to Snæfellsjökull Glacier – or maybe even join a tour to hike it! 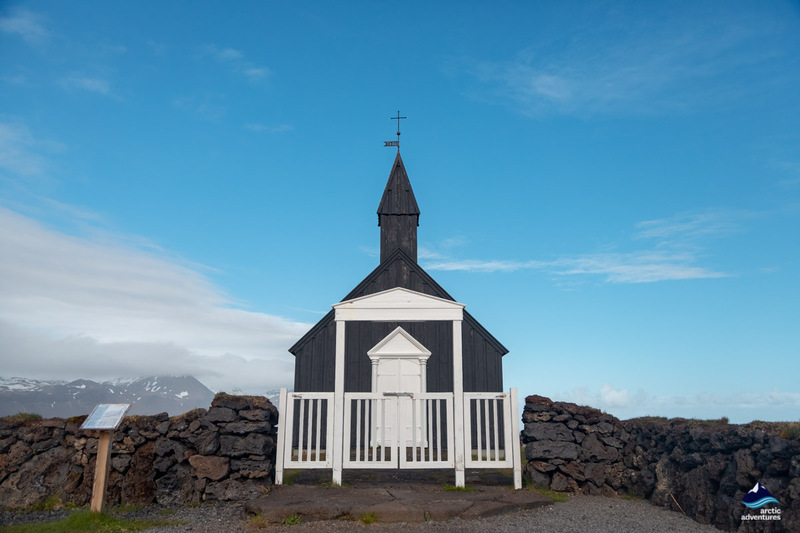 Have lunch at Hotel Búðir and check out the famous Black Church – this is where seals play on the beach right outside and true serenity is found! 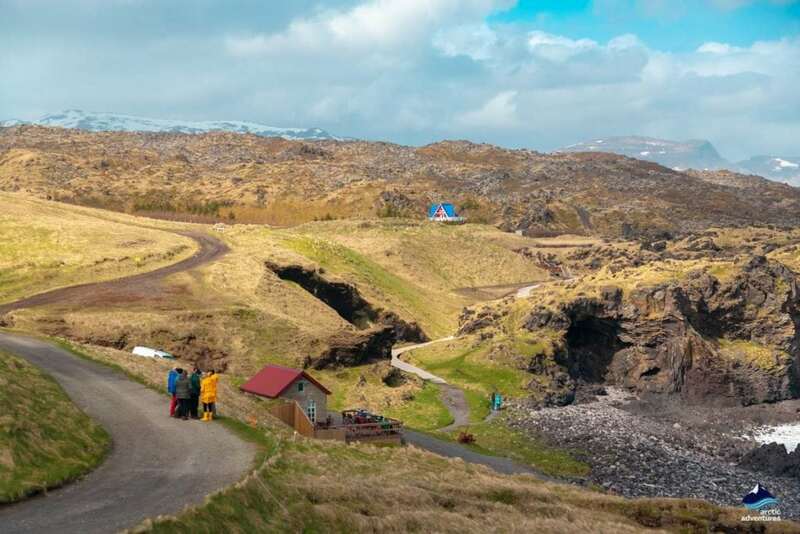 Visit at Lava cave – Lofthellir or Vatnshellir are both easily visited on great guided tours. Walk on the pebble beach Djúpalónssandur – or even test your strength with the four lifting stones which were used by fishermen to qualify and place men in the right order on the fishing boats. 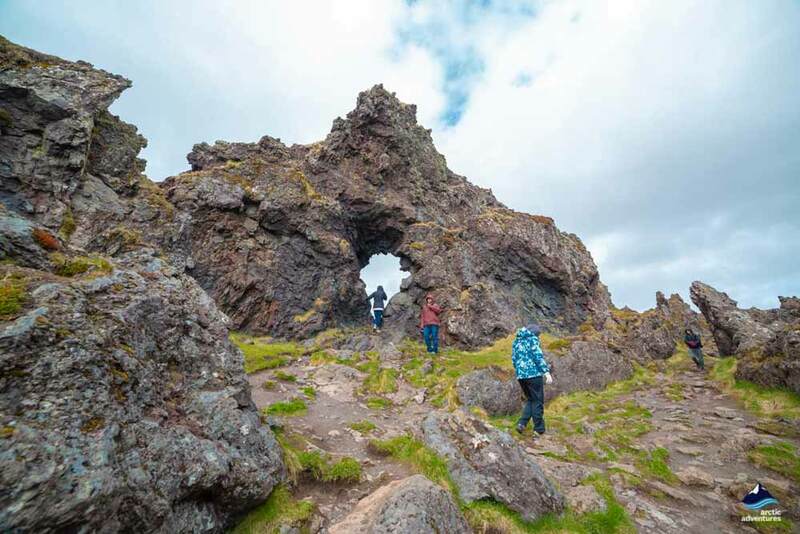 Witness the fabulous Lóndrangar rock formations – some of nature’s best sculptures! Ytri-Tunga seal colony – for the ultimate cuteness stop! 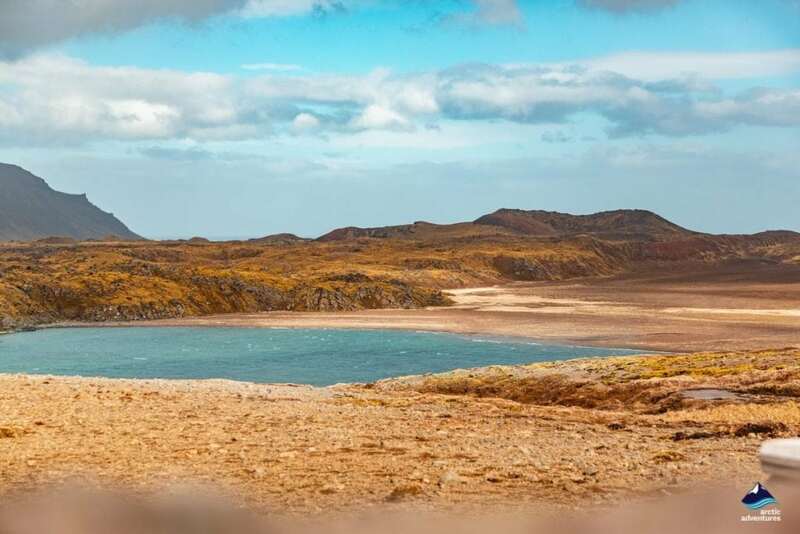 Visit the Rauðmelsölkelda mineral spring – take a sip of natural sparkly water coming straight up from the ground. Just remember to take a bottle with you! Take a dip in Lýsuhólslaug mineral water pool – fed with water from the hot spring right next to the pool this place is an authentic Icelandic bathing experience. 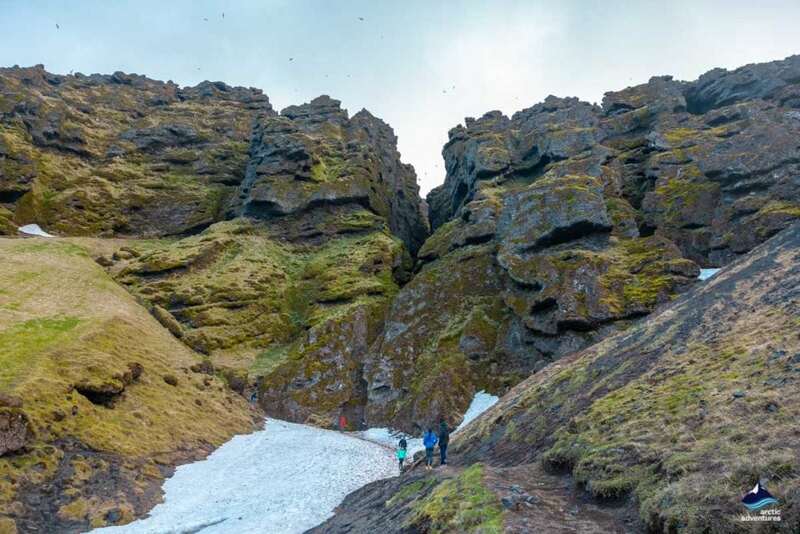 Rauðfelsgjá Gully – a wondrous place to behold, looks like a backdrop straight out of a Game of Thrones/Lord of the Rings scene. 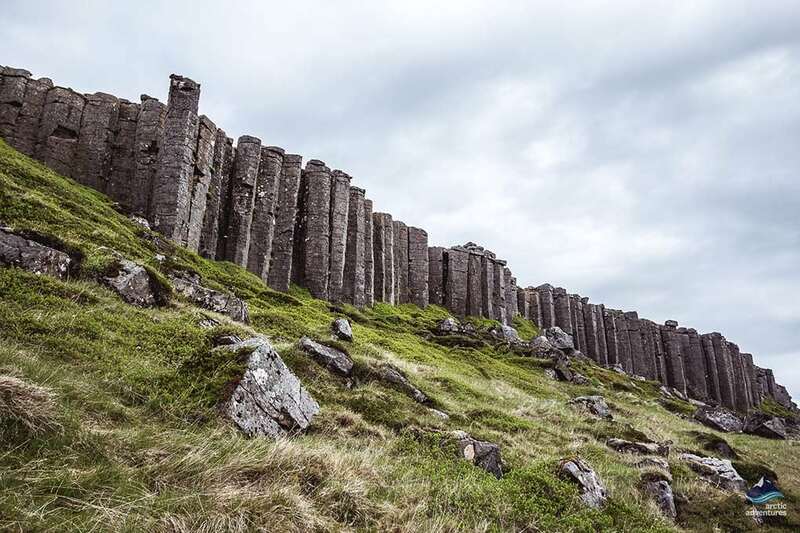 Visit the Gerðuberg Basalt Cliffs – yet another place to see how the land of ice and fire has through the centuries created the most intense and amazing landscapes and natural sculptures. 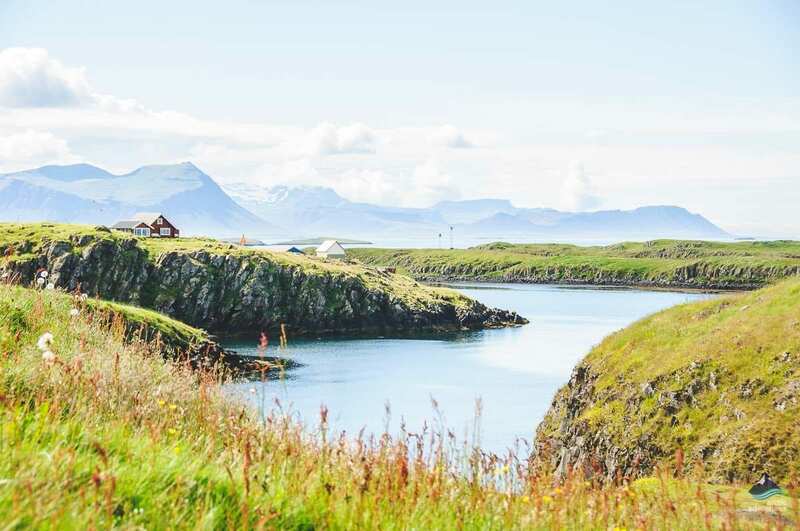 Where to eat on the Snæfellsnes Peninsula? From South clockwise around the peninsula – Firstly South, West then North and East. Grillhúsið at Borgarnes, a great BBQ. Rjúkandi Café & Restaurant, perfect for a cake and coffee, yummy soup! 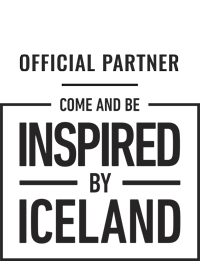 Langaholt, their motto “nature provides – we deliver” explains their delicious authentic fish based menu. 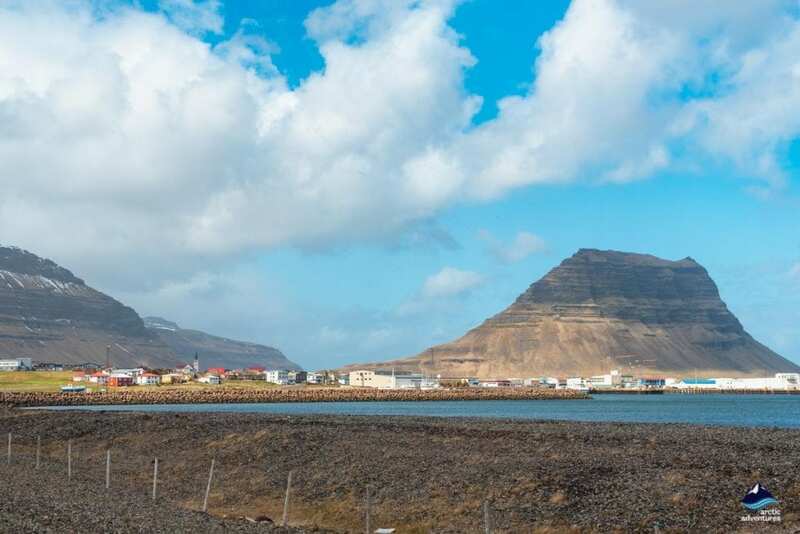 Hótel Búðir, a scenic place to enjoy a meal, great variety and taste! Mönsvagninn, fish and chips, simply yet savory comfort food. Fosshótel Hellnar Restaurant, the fancier option with beautiful ocean views. 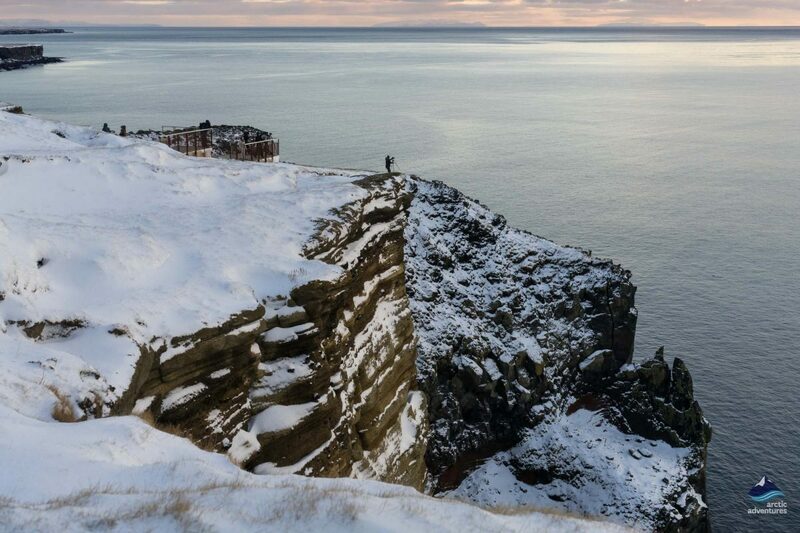 Fjöruhúsið, a small and cozy café with mind-blowing views. 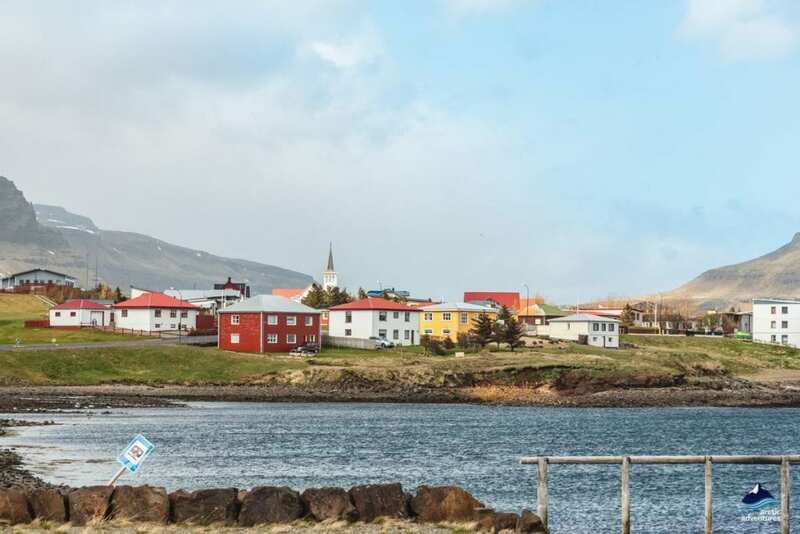 Viðvík Restaurant, dinner, drinks or even coffee they do everything well in a charming setting. Gilbakki Kaffihús Gamla Rif, a step back in time, this graceful old timber house invites you back into Icelandic culture with architecture, decorations and baked goods. Kaldilækur Café, open in summer, this friendly family-owned hut sells fabulous soups, cake and coffee. 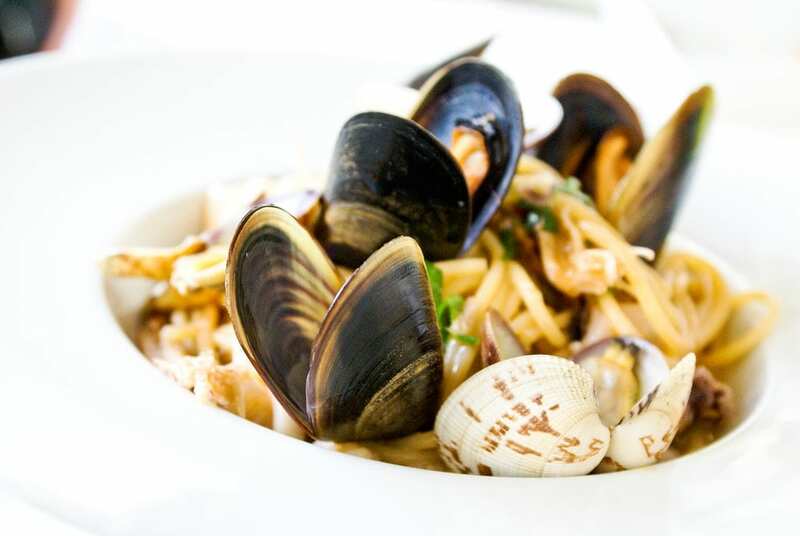 Sker Restaurant, a new local seafood-focused restaurants visitors can’t stop raving about. Hraun Restaurant, budget-friendly and located next to the fishing harbor, great variety! 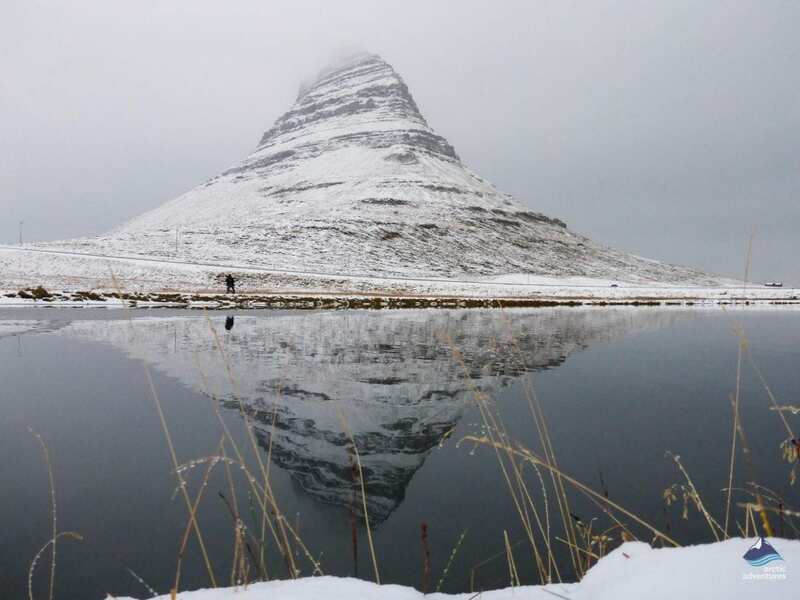 Bjargarsteinn Mathús, great food, great Kirkjufell view – the perfect foodie experience. Café Emil, an intimate family-run café located in the heart of the village. Homemade goodies and great for info! Sjavarpakkhusid, seafood and lovely vegan options right down at the harbor. Narfeyrarstofa, the most famous restaurant in Stykkishólmur raved for tasty seafood and other local dishes. Skurinn, this yellow cabin is a burger joint with good vegetarian options. Finsens Fish and Chips, taste Iceland with delightful fish and chips. Stykkið Pizzagerð, for cheesy, appetizing and affordable pizzas. Café Nu, good coffee, great breakfast bowels and have an outdoor sitting area. Nesbrauð Bakery, hard to miss marked clearly with a large bakery sign, pastries par excellence. Meistarinn, for an Icelandic hot dog experience at another level! 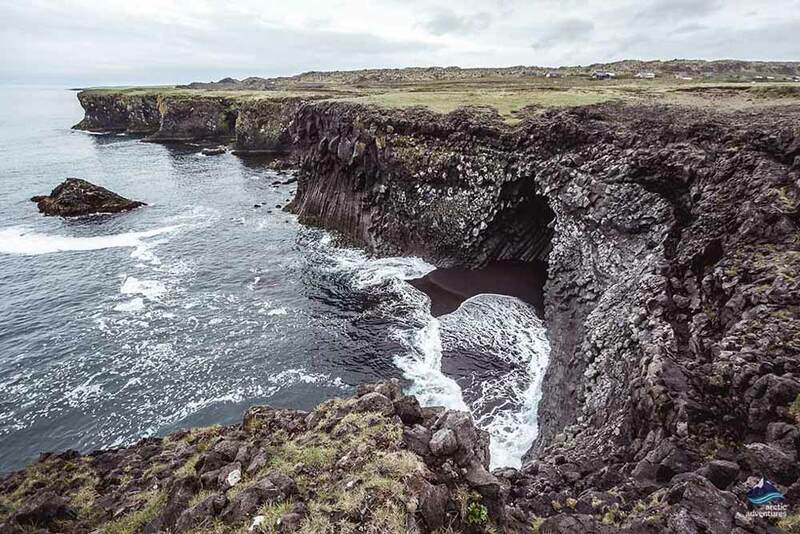 Camping at Hellnar, the campsite Snjofell at Arnarstapi is a beautiful experience. It is quite a large camping site and known for exquisite marine views. Camping at Hellissandur is an opportunity to a scenic sleeping location. The site is quite new, made in 2011 and all the basic service is found there, a gas station, a museum, a supermarket, and a swimming pool. 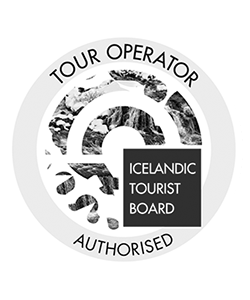 Facilities include running water, toilets, showers and electricity (500 ISK). 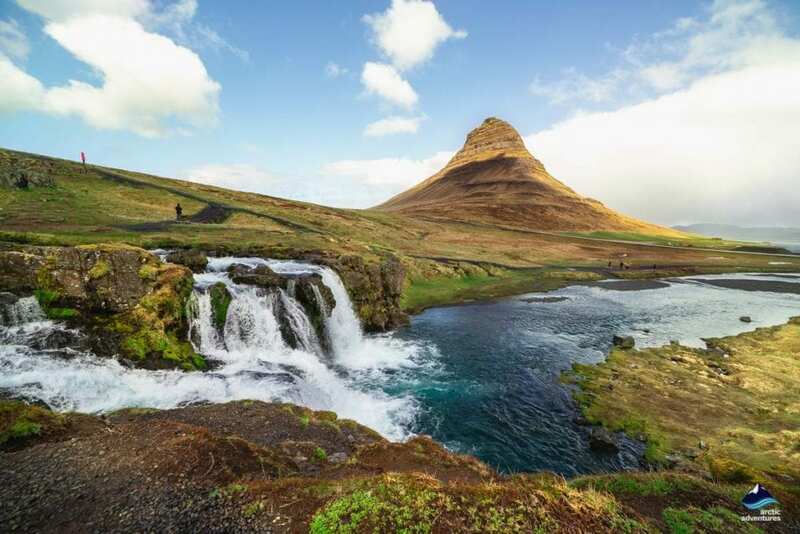 Camping in Grundafjörður an excellent chance to view Kirkjufell during day and night. Located right next to the swimming pool and has electricity for campers for additional 950 ISK. All information for the camping site is provided at the swimming pool’s reception. 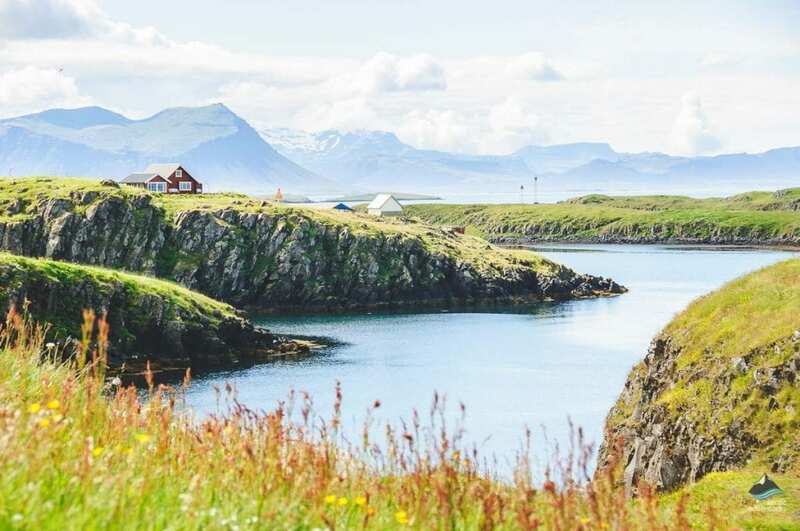 Camping in Ólafsvík is located at the charming Ólafsvík municipal boundary. 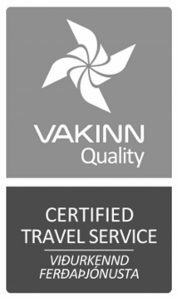 The facilities include showers, toilets, electricity (500 ISK), running water, a playground and nearby you can find walking paths, a swimming pool, a golf course and restaurants. Camping in Stykkishólmur one of the best-equipped campsites in Iceland. Facilities include running hot and cold water, toilets, showers, electricity (850 ISK), washing machines, tumble dryers, WIFI, a playground, a dining tent, a waste disposal, sports area and nearby a swimming pool and a golf course. 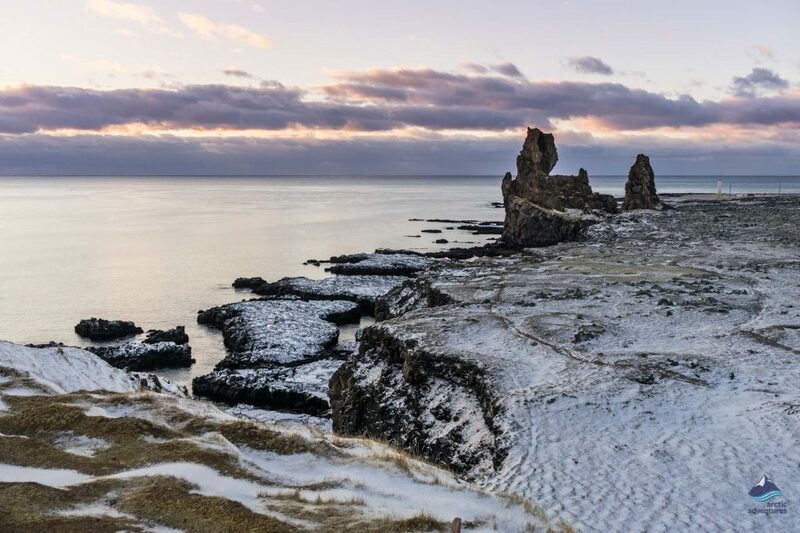 When planning a winter trip to an already pretty cold location like Iceland one might be able to guess that it will not be a warm vacation but Snæfellsnes will surely make up for it in beauty. 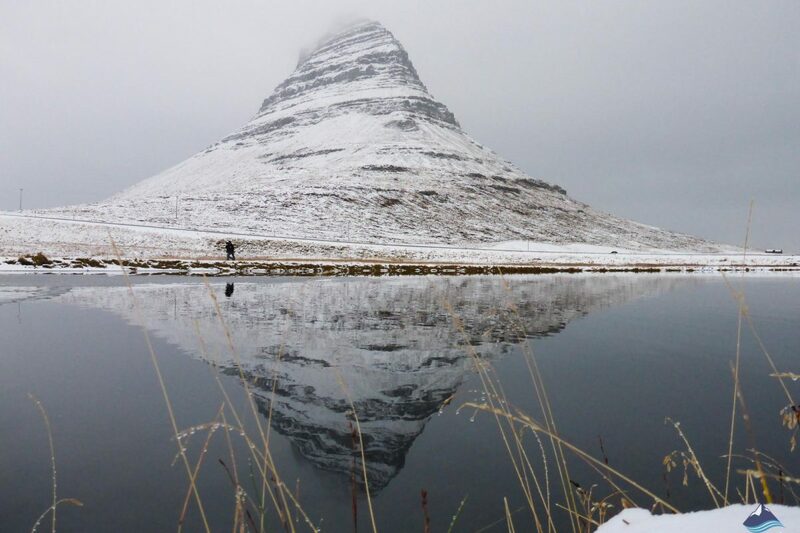 Seeing Kirkjufell in its snowy winter coat, the frozen drops fall from Bjarnarfoss waterfall, enjoying a hot meal at the colorful town of Stykkishólmur or watching the Northern Lights dance above Berserkjahraun lava field are all precious winter experiences you can have while visiting Snaefellsnes during the coldest months. You just need to dress warmer and if you aren’t used to driving in snow you might want to rethink driving on your own. 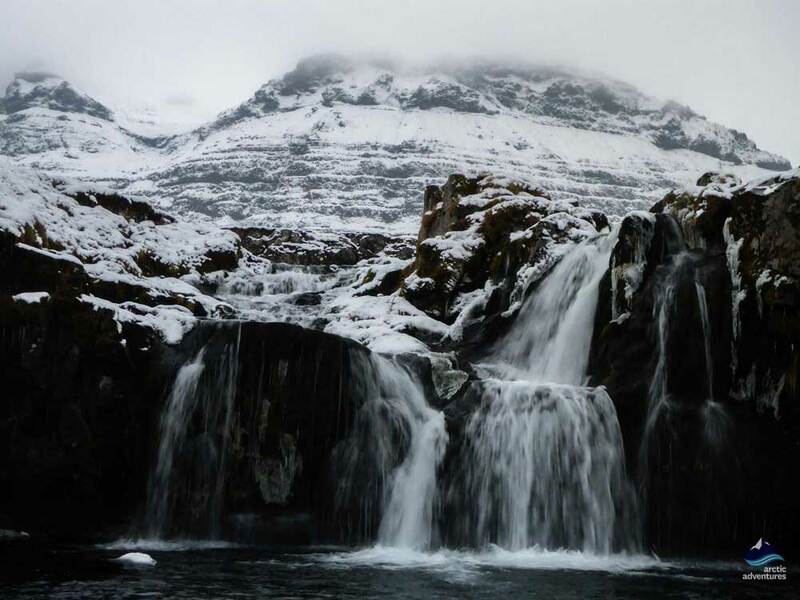 But, no worries, Arctic Adventures offers both day and multi-day tours to Snæfellsnes all year round! 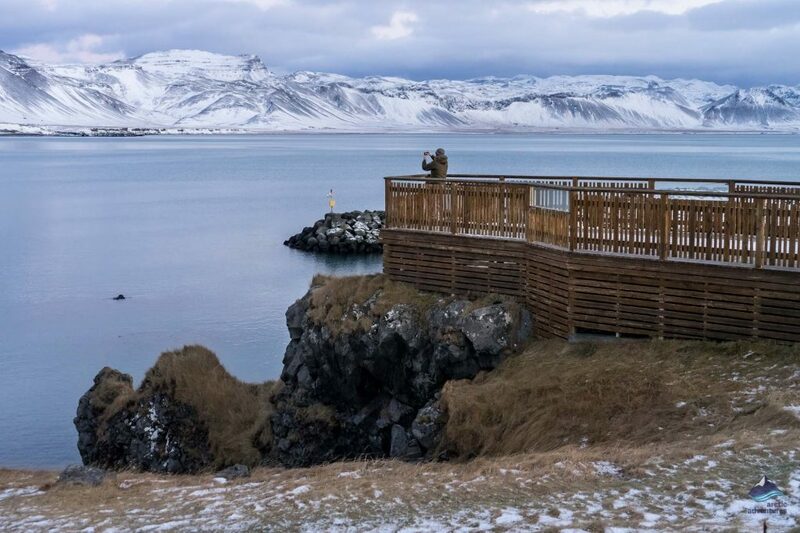 The Secret Life of Walter Mitty (2013) Many link the movie’s Secret Life of Walter Mitty filming directly with Iceland as so much is shot here. 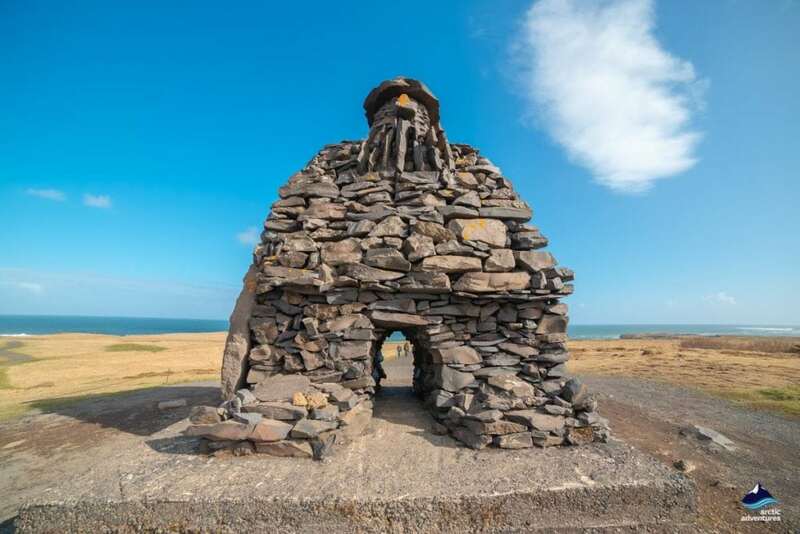 Stykkishólmur plays an important role in the movie along with the Papa John’s which in real life is actually Geirabakarí at Borgarnes. 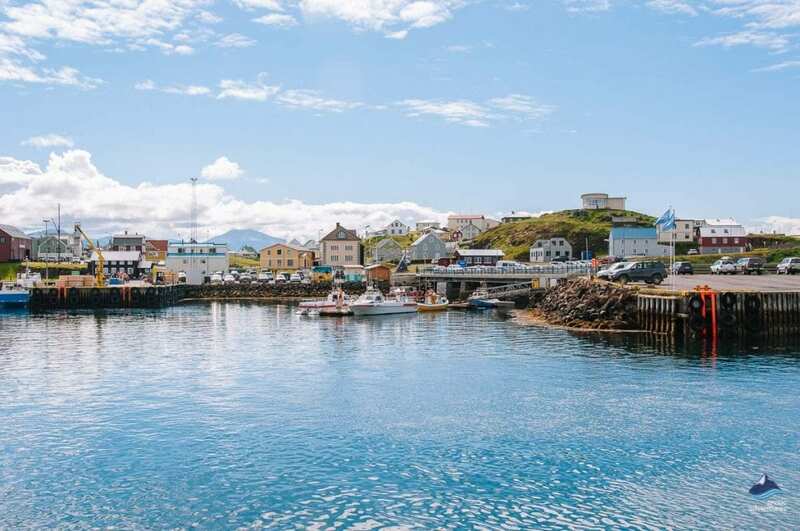 In the movie, Stykkishólmur is a town in Greenland and the bar and helicopter scenes are all shot there. Fun Fact: The Icelandic actors Olafur Darri and Gunnar Helgason play roles in the movie. Journey to the Center of the Earth (2008) A Brendan Fraser, Josh Hutcherson and Anita Briem film based on a Jules Verne book filmed in the Snæfellsnes National Park as the Snæfellsjökull glacier is the main focus, being the opening to the center of the earth! 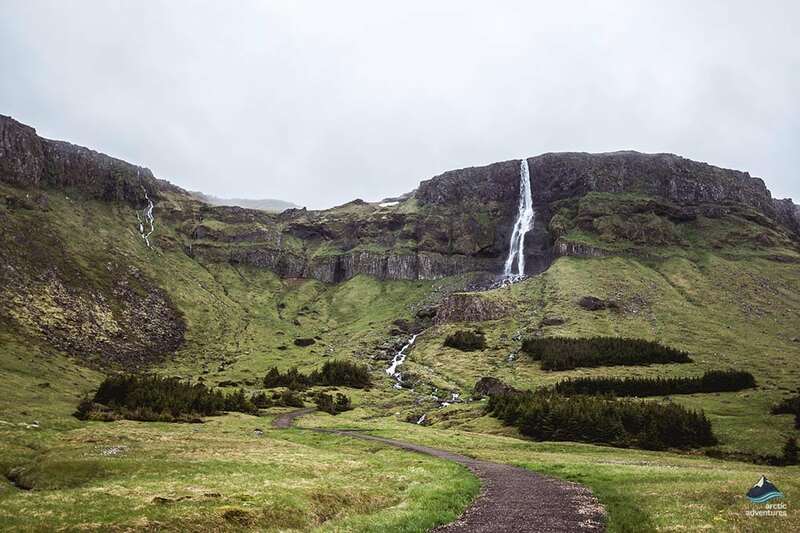 Game of Thrones (season 7) The popular TV series has been shot all over Iceland but one of the more memorable scenes is the one with the Arrowhead Mountain “played” by Kirkjufell Mountain. In the series, the Hound has a vision where the mountain appears and then again in the scene were Jon Snow and his heard are marching to fight the army of the dead. Elliphant – Down on Life (2012) This Swedish band shot the whole video in Iceland and the opening scene reveals horse being ridden on the Löngufjörur beach on the Snæfellsnes Peninsula. Simply amazing!